Plants are the Strangest People: Anthurium no. 0558 "Amber Waves"
Amber would bother me, due to the bloom/name color mismatch,1 except that there is very little chance that she's going to stick around long enough to be a problem, so I'm not changing her name. I don't know what happened here for sure. There are a number of bacterial and fungal infections that can hit Anthuriums, one of which (anthracnose, caused by the fungus Colletotrichum gloeosporioides) turns spadices black, but I don't think that's what's going on here, because anthracnose doesn't shrivel them up. Though you can tell from looking at the spathe that this bloom was likely having multiple problems, so I suppose we can't rule it out. 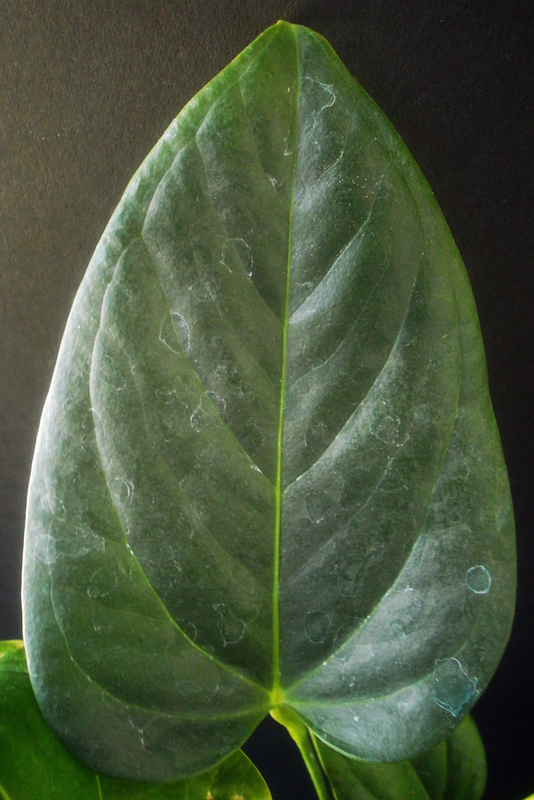 Also, while I realize that any bacterial or fungal problem would have to hit some seedling first, it seems like I've had enough Anthuriums here for long enough that if I had some sort of spadix-eating disease lurking around, I would have seen it hit before this. 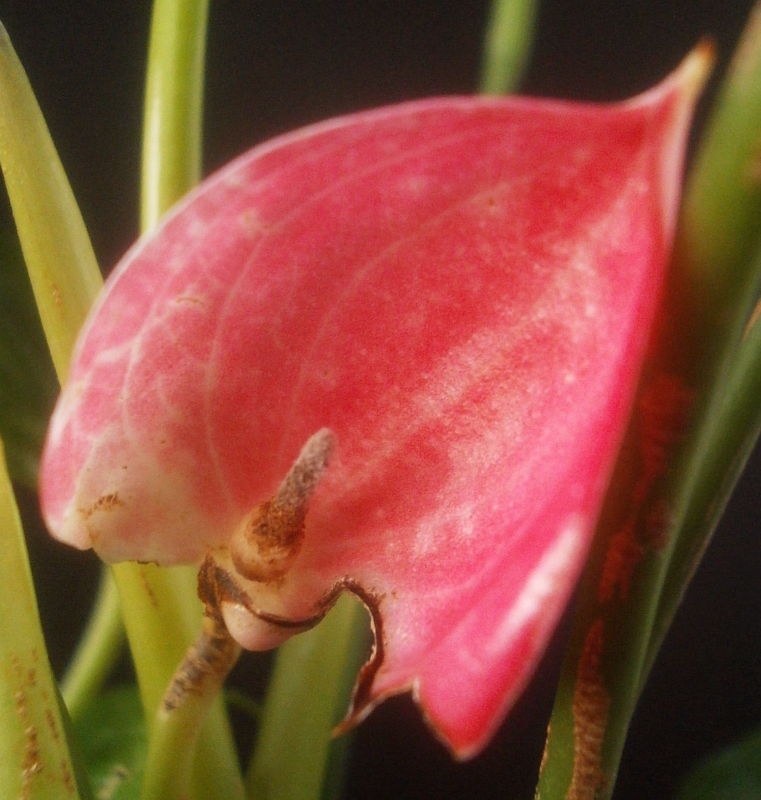 Amber's my 98th Anthurium seedling to produce a finished bloom, after all. That's a lot of spadices coming and going before this particular problem showed up. So I would be surprised to find out that it's a bacterial or fungal problem. Maybe Amber was just having a really bad day. I've said enough times that it's not a good idea to judge a seedling by the first bloom it produces. So we'll see if the next one is better. I'm not expecting it to be so much better that it saves Amber from the garbage can, but we'll see. Even the best-case scenario here has Amber as just another red or pinkish-red, so she's probably not worth waiting on, but I probably will anyway. If nothing else, I'd like to get a better photo to remember her by. 1 This wasn't a problem I'd considered, when I started out, and then a lot of the seedlings saddled with problematic names have died, so for the most part, it hasn't mattered. It's still potentially a problem for 0039 "Honey Mahogany," 0043 "Jade Jolie," 0084 "Chocolate Sunrise," 0490 "Rusty Ryan," 0532 "Amber Alert," 0605 "Rusti Fawcett," 0654 "Rosie Cheeks," 0691 "Jade," and 0949 "Cherri Baum," and so far only two of those (0039 and 0532) have even attempted to bloom, so I'm not going to bother renaming them just yet. Three (0490, 0605, and 0949) are even likely to bloom in name-appropriate colors, should they bloom, so they'll probably work out without me having to do anything. The only reason this is an issue at all -- because, remember, these were only ever intended as place-holder names -- is that it's a lot easier for me to keep the names straight if they don't contradict the blooms. 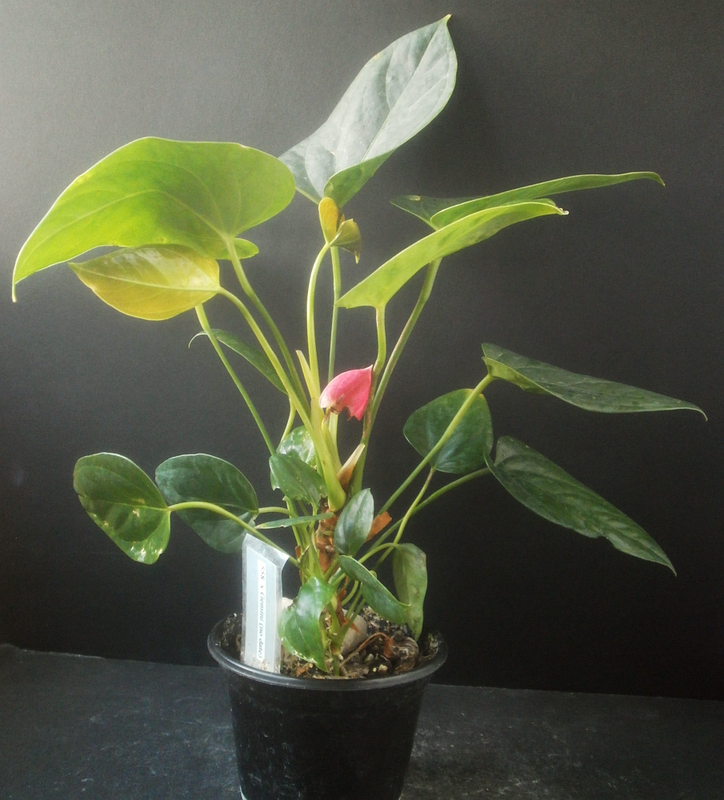 I still have a tough time with 0237 "Roxy Casbah," because my brain insists that any seedling named "Roxy" has to have red spathes, not pink. 2 Though the don't-get-attached part is a problem.